The Royal Arms is an emblem that is respected and recognised across the world. It has been used on the United Kingdom’s coinage for hundreds of years, with the Arms of England first appearing on a coin in the fourteenth century. A true national symbol that all of us recognise, the Royal Coat of Arms was first used on medieval battlefields on shields, banners and dress. It has evolved through the ages and is a true indicator of power, approval and duty. The Royal Coat of Arms identifies the monarch of the country and their ancestry through specific emblems and heraldic devices dating back over nine centuries. The current Royal Coat of Arms of the United Kingdom contains the main elements that were brought together due to an Act of Union with Scotland in 1707 and Ireland in 1801. A quartered shield forms the centrepiece, while three passant guardant lions of England, dating from the reign of Richard I, feature in the first and fourth quadrants. Scotland is represented by the rampant lion and double ‘tressure flory-counterflory’ in the top right, with the harp of Ireland diagonally below. The shield is supported on one side by a crowned English lion and on the other a Scottish unicorn, held firmly in chains. Below is the rose, thistle and shamrock, representing England, Scotland and Ireland respectively. This contemporary version is unusual in that it includes the leek of Wales. This coin features a radial background, exemplifying this design, which is being featured on gold and silver bullion coins for the first time. 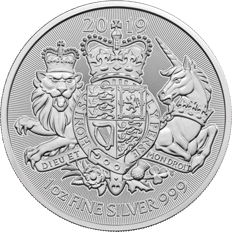 The Royal Arms silver bullion coin is struck in 999 fine silver. 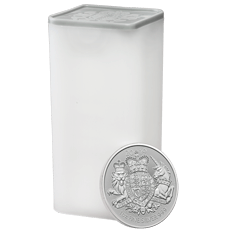 This silver bullion coin benefits from capital gains tax exemption for UK individuals and is available with free UK delivery.